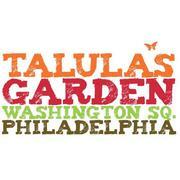 Talula's Garden & Daily, a Stephen STARR & Aimee Olexy collaboration, is actively seeking experienced food runner to join our team. Candidates should enjoy working in a fast paced environment and must be able to multi-task and communicate well under pressure. This is a fantastic opportunity at Philly's most acclaimed Farm to Table restaurant, with the fastest growing restaurant group in the country. Join our amazing team - apply today. Room for upward mobility & growth.